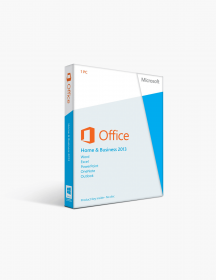 You're reviewing: Microsoft Office 2010 Home and Student International License. Microsoft Office 2010 Home and Student International License. 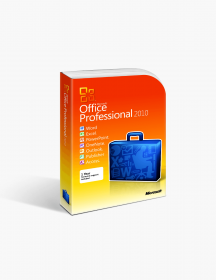 Office 2010 Home and Student International License carries Microsoft’s mark of excellence in productivity software and further shows the tech giant’s continued commitment to the global worker of the 21st century. This edition focuses on improved apps and interface, with web and mobile versions available for an unhindered working experience anywhere, anytime. Additionally, the International License included in this suite allows you to install your Office apps on multiple machines without any borders. The vastly popular Word 2010 gives you the edge you need in writing both simple and complex text documents, with a renewed interface featuring new amazing ways to insert, edit and style your texts. Excel 2010 is another app with worldwide recognition in this Office suite. It is the ultimate tool for tables, spreadsheets and workbooks - now it is even better than before, thanks to numerous interface and data management upgrades. The favorite presentation app of millions, PowerPoint 2010 is another unsurpassed ingredient in this Office version. Equipped with even more flair, this tool will take your presentations to new heights, making sure your slides are not only organized splendidly, but also have impressive visual effects that will captivate your audience. OneNote 2010 is an amazing team-oriented application that will assist you in everything related to your projects. From note-taking to live editing with your colleagues or team members, OneNote is your virtual notebook, and every ounce as valuable. In short, Microsoft Office 2010 Home and Student fully lives up to the platform’s reputation as a pioneer in productivity tools. With the International License edition, you get the perfect combination of high-quality apps and practicality in a world where families and businesses are often scattered across the globe. The specific features of this excellent office suite will be listed in-depth below. Cross-application Ribbon interface - Originally introduced in Office 2007, the Ribbon comes back to the 2010 version, better than ever. Now available across all apps in the Home and Student edition, this interface upgrade represents a comprehensive, fully-customizable field where you can select the formatting tools you need for your specific project. The Ribbon is always with you, but it is designed to be as unobtrusive as possible, providing you with all of the efficiency and none of the hassle. In addition, the Ribbon interface now has contextual tabs to help you with specific tasks (e.g. selecting a graph will open the graph formatting tab), making it one of your most valuable assets. New Backstage section - A completely novel feature in Microsoft Office, the Backstage view is, simply put, your old File tab on steroids. It offers you the basic document management functions such as saving, printing and undoing changes, but also opens the door to a slew of new actions you can take with your files - from password encryption to print previews, you can do it all at a moment’s notice. The Backstage is certainly a feature that contributes to Office 2010’s place under the spotlight. View before your commit - Speaking of previews, Microsoft Office 2010 Home and Student Edition makes taking peeks at potential styles, colors and fonts a hassle-free job. Particularly useful if you have a knack for impulsive, what-if changes, this feature allows you to see how your project would look after your modifications as soon as you mouse over the effect. With Office 2010’s innovative previews, your artistic urges no longer leave a tedious mess to clean up, giving you more time to focus on what is really important. Project collaboration made easy - A paramount addition to Microsoft Office 2010 Home and Student’s arsenal of new features is coauthoring. Introducing collaborative tools that allow multiple users to work on the same Word, PowerPoint or OneNote document and SkyDrive integration, coauthoring brings amazing functionality on the table and enhances project coordination with minimal efforts. Synchronization mechanisms are also in place to prevent any malpractice or sudden changes. With co-authoring, the nightmare of groups keeping up with the latest file revisions is a thing of the past. 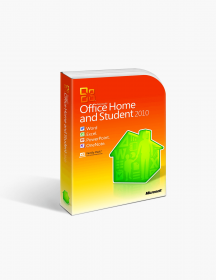 Multi-platform functionality - Continuing in the vein of making your workflow process easier, the Microsoft Office 2010 Home and Student edition gives you unprecedented freedom in accessibility. If you are someone who likes to take their projects with them and often find yourself working on the go, you will love the new web and mobile versions of your favorite Office apps. Fully optimized and with resolution scaling to match and preserve the original well-kept view of your files, these additions make it a breeze to edit, improve and share your work in the most productive manner, no matter if you’re on your computer, on your smartphone, or on the Internet. PowerPoint gives you even more - For the presentation virtuosos out there, PowerPoint 2010 returns with even more goodies that will surely wow your audience. Presentation work is moving more and more towards a focus on visual effects and a clean yet stylish layout. Microsoft Office 2010 delivers heavily on that front with amazing new features to the presentation app you know and love. Now you have a plethora of new visual and 3D effects, creative borders and most importantly, vastly improved video editing that allows you to trim down any parts that you find unfit for your excellent presentation. With PowerPoint 2010, you can really let your creative side take the wheel, and show everyone how presenting is done. Spreadsheets for everyone - The minor changes in Excel 2010 speak of two things: one, the app is already very well optimized, and two, Microsoft’s efforts are directed at making it more accessible to a wider group of people. Improvements include more intuitive formulas, color-coded tabs, the addition of diagrams, charts and smart tools, as well as quick data import tools. In short, Microsoft Office 2010 makes Excel an even more versatile and customizable app than before. Microsoft OneNote - This app is so good, it deserves to be listed as a feature in itself. The main reason for that is its relatively low popularity compared to other office juggernauts in the Home and Student edition. However, you probably already have an in-depth understanding of Word, Excel and PowerPoint. OneNote is a new kid on the block and it carries all the quintessential characteristics of Microsoft Office 2010 - it’s innovative, collaboration-oriented and very useful for any project you might be working on. Think of OneNote 2010 as your trusty notebook where you store all your valuable ideas and notes. Now add the benefits of your whole team discussing and organizing your projects with you in real time in a quick, easy and efficient way. This is the recipe for an app that will skyrocket your productivity and give you and your group the tools you need to create perfection. The OneNote app is undoubtedly one of the strongest additions to Microsoft Office 2010 Home and Student; give it a chance and you won’t look back. Why Choose Microsoft Office 2010 Home and Student International License? Less is more - Home and Student is the most basic option of the Microsoft Office suites. It doesn’t include big business-oriented tools such as Outlook, Publisher or Access, making it perfect for those of you who have no need for dedicated desktop e-mail or publishing and software development tools. It’s perfect for students, providing excellent flexibility and utility for all your education-related tasks and goals. No matter how many good friends you have, prepare to make room for one more in Office 2010 Home and Student. This Office 2010 variant is a solid choice for all sorts of workstyles. At home or on the go - the choice is yours. Microsoft Office is here to put the tools in your hand, be they desktop, mobile or web. If you own a small or medium business, you won’t need anything else once you get a hold of Microsoft Office 2010 Home and Student. It gives you all the necessary functionality and features to help you create, manage and preserve your important documents, and then some. Instead of buying a separate licensed copy for each location, with Microsoft Office 2010 Home and Student International License you have all the flexibility you need, in one place. The addition of the International License makes the Home and Student edition available on multiple devices, providing you with easier management and accessibility, as well as saving you money and effort. These are minimum system requirements for installing Microsoft Office 2010 Home and Student International License. CAD$74.00 | In Stock Want it Now? Order and receive your download instantly.